Redefined sensational rapper and Street Ambassador, AWODOYIN MAYORKUN, popularly addressed by his stage name SUPERWOZZY is set to give his Day-1 supporters, fans and audience an awesome Musical Concerta at his home base at AKURE, ONDO STATE. The energetic, fast rising rapper who is also popularly known by a track titled 'Fine Girls like Us' also recently dropped a track titled Hustle and Pray. He has declared his first major headline Concert "Superwozzy Live In Concert" to hold on the 5th of April. This Concert promises to be a pace setter as it'll also be hosting your favorite entertainers, crowd controllers and music artistes from this part of the country. 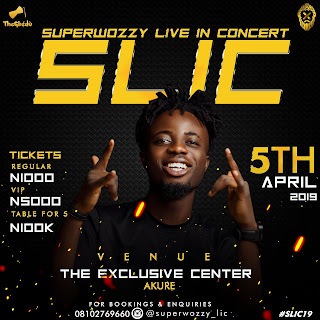 Superwozzy Live In Concert SLIC is set to hold 5th of April and tickets are now fast selling by your favorite online vendor.